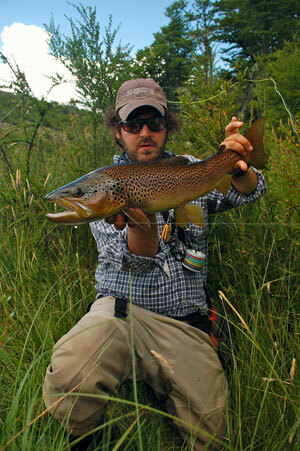 Felipe Maroles holds an Argentine brown trout caught sight-casting. I RECENTLY took a trip to Argentina, and it had nothing to do with a fancy lodge, or massive sea-run brown trout. Yet it was the single best trout fishing experience in my life. Why? Because it was all about sight-fishing. For me, sight fishing is top of the fly fishing game. I don’t care if you’re talking tarpon or bonefish, steelhead or brown trout… seeing, then stalking, then casting, then connecting is the reason I do this in the first place, and the reason I always will. I stayed in an estancia by the Rio Alumine, in far northern Patagonia, well north of where most gringos have experienced. I fished with Felipe Morales, Katy Melo, and Javier Herrera. The Alumine is a large, trout-laden river, but we never fished it. Instead, we bushwhacked into a number of smaller spring creeks, where big browns, rainbows, and brookies eagerly ate dry flies — if you knew where to put the bug. Perhaps most importantly, the trip proved to be a great learning experience. Like many American anglers, I’ve developed my own notions about sight-fishing, but the Argentines have some notions of their own, and they work. If you follow this logic, and apply this thinking to your favorite sight fishing scenario, you will catch more fish, from the Rockies, to Michigan, to the Catskills. Stay Dry. The more you wade, the more your chances of spooking the target. Cast from the bank, if you can. The higher the water-mark on your waders, the less your chances are of hooking the fish (the worse your angle is to see fish as you cast). Wade less, catch more. Proven, perfect advice that runs counter to what many American anglers practice, myself included. Know How to Find a Target. Sounds simple, but the secret to spotting fish in a river is knowing where to look. Focus on seams and changes in water conditions (structure, depth, etc.). Make a mental “window pane” and look through that window… eliminate possibilities… and move your window pane template, foot-by-foot, until you find a player… only then do you think about casting. Make Your First Cast Matter. Again, simple advice, almost like a football coach saying, “Let’s run the opening kickoff for a touchdown,” that’s easier said than done. The angler can do things to optimize that first cast however… measure your line… gauge the distance… consider shadows… you should think about 10 things before you even lift the rod. We Americans tend to “see and go,” and that’s a bad move. Never, Ever, False Cast Above a Target. Shadows kill opportunity, and casting shadows will make that perfect last cast irrelevant, compared to the second-to-last, so-so cast that happens out of the trout’s field of vision. False cast to the side, then drop it in the zone. Always. As a matter of habit. Without question. One Shot… Switch Bugs. This is something these guides live by, and something I’ve been too lazy (stubborn) to embrace. Make a cast. If the fish sees the bug, and doesn’t eat it, switch. Always, without exception. You’ll never beat a wild trout into submission. Size Down Through the Process. If you’re on a specific hatch, great. If you’re prospecting in mid to late summer, start big (hopper)… no dice, wait. Tie on a caddis… cast. No dice, wait. Tie on a mayfly dry. Wait more. Watch them resume the feeding rhythm, then cast. Never, ever, cast to a fish that has stopped rising. Match the Fly to the Water, Before You Cast. Deep=Big. Shallow=Tiny. The more you change by trial and error, the more the chances go down. The deeper and faster the water, the less time a trout has to scrutinize, and the more eager the bite. The shallower and clearer, the water, the more the bug pattern matters. If you see a player in big water, throw a big fly. If you see a player in skinny water, size down, immediately. Never Line Your Fish. So much has been said about the color of a fly line… but the color matters none. Lining a fish with a camo-gray line is the same as lining a fish with a neon-orange line. The fish should only see leader, tippet, and fly. Clear. Only clear. Any color is bad color. The Drift Trumps Tippet Size, Always. A good drift (without creating micro-wake) with 4X tippet will fool even the most persnickety trout. A sloppy drift with 7X tippet will ruin your chances, every time. When in doubt, always have the line, leader and tippet upstream from the fly as it enters the feeding zone. These guys fish thick, but they fish smart. Fishing skinny, but sloppy, won’t ever help you. Follow the Pattern. Fish feeds left… right… drops three feet in the run, eats again… then pauses. Then left, right, drops down…. Watch the rhythm, and place the cast accordingly. Fish feeds left, you cast right, after a pause (consider the tempo). Lose the pattern, and lose the rhythm, and you lose the bite. You’ll rarely force a bite out of the natural rhythm. As with jazz music, the more international “flavors” and ideas you integrate, the more your ability to improvise grows.